According to all economic indicators, Downtown New York is still in a process of recovery. Nowhere is that more evident than in the small business community. With so much reconstruction aid still frozen in the LMDC, Downtown appears, as much as before, to be a community in which individual business people must "bootstrap" themselves back to stability. Having run a series on "stories of grit and survival" among small commercial businesses Downtown, we now turn our focus to careerists--the tastemakers, business leaders and civic activists who instruct us by their example. 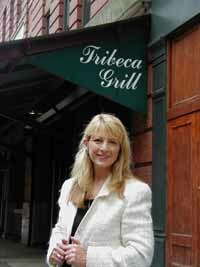 Strategic consultant Patrice Samara feels like the Tribeca Grill is her comissary. Patrice Samara ushers us into the breezy, plant-festooned atrium of the Tribeca Film Center where, on any given day, you may find young producers with laptops--polishing treatments, film budgets or a screenplays, waiting for meetings--presumably in preparation for career-making projects. The building is a Mecca for the hopeful and anticipation weighs heavily over it. Perhaps that is why the place is engineered for tranquillity, with welcoming sunlight diffusing throughout the comfortable, tasteful furnishings. Located on the corner of Franklin and Greenwich Streets, the Tribeca Film Center has the feeling of a Hollywood studio while also having absorbed the "resonance" of the Downtown entertainment community which it was designed to serve. To the outsider, it seems to have a combination of energy, risk and creativity. Patrice Samara, nee an Emmy-winning film/TV producer and now an international and U.S. strategist, says this is an atmosphere she can’t do without. Samara's company, Triumph Entertainment, is based there. You could assume that Samara wanted to be close to the resources of the Downtown film business after more than 20 years in it, but that’s only part of the story. Ms. Samara has made the career leap from Emmy-winning filmmaker to strategist, all the while keeping her Downtown location, Downtown sensibility and Downtown edge. As a producer at The Glyn Group until the late 1980s, she specialized in "deliverables"--films, interactive media, video news releases and home videos, such as Muppet Babies Video Storybooks (with the late Jim Henson). Not as a strategist, she observes, but as a producer. The Glyn Group was located on West Fourth Street between Charles and Perry Streets. It morphed into GlynNet, which specialized in location-based entertainment and corporate communications and subsequently came under WNET's umbrella, operating on West 57th Street. But Samara was moving more and more into strategic planning, drawn by the faith of her past clients, who had previously hired her for fulfillment of their business strategies, when her advice was value added. Now it's an integral part of her services for hire. Currently, Samara has a practice in strategy, communications, global events and the orchestration of significant business milestones and anniversaries. Past and present clients include American Express, Cheseboro Ponds, CBS, IBM, Advanced Network and Services, Community Service Society, Children's Aid Society, Council on International & Public Affairs (CIPA) and the Program on Corporations, Law & Democracy (POCLAD) and DIsney. She co-produced (with Maurice Hines) the memorial celebration for the late Gregory Hines at The Apollo Theater. Right now, she is consulting with the Museum of Arts & Design (40 W. 53rd Street) on their major fundraising event, producing their "Visionaries! 2004" event honoring Ken Himmel (President and CEO of Related Urban Development), the developers of Time Warner Center, designers Massimo and Lella Vignelli, and famed glass artist Lino Tagliapietra. Samara has a specialty in businesses with anniversaries. When a business or nonprofit turn one, ten, twenty, fifty or a hundred, they usually embark on some particular undertakings that are a combination of self-assessment and marketing. It was she who produced American Express's 100th Anniversary film, with a campaign that included production worldwide. On October 13th, 2004, under her guidance, Midtown's Aaron Faber Gallery (666 Fifth Avenue) will celebrate its 30th anniversary, kicking off with a "Dream Collection" of watches followed by an unforgettable installation by 30 world-renowned studio artists, 30 pieces of estate jewelry and 30 outstanding rings from their bridal collection along with a special catalog and photography exhibition. Cheseboro-Ponds' 100th Anniversary was marked by an anniversary film and a study of the American Family by artist Robert Dash which toured around the United States. Sometimes anniversaries are combined. Last spring, for the 50th Anniversary of Council on International & Public Affairs (CIPA) and the 10th Anniversary of Program on Corporations, Law & Democracy (POCLAD), she organized a "50/10 Anniversary Benefit Concert" featuring Work o’ the Weavers with a rare special guest performance by Pete Seeger and an exhibition of political cartoons by Matt Wuerker. So how do the creative people morph into strategy makers? As Patrice Samara worked on larger and different kinds of PR projects, her clients requested that she become more involved in the strategic portion of what they were doing. It was an evolution born of her natural talent for strategic thinking. Now, she advises on global strategizing and positioning, which generally comes before PR efforts—public information and marketing—begin. At some point, she realized that a large part of her clients were nonprofits, so she attended the Nonprofit Marketing Program at NYU so she could better serve her philanthropic clients. With clients like hers, why has she worked, since 1995, out of the Tribeca Film Center? It's not just for the film aspect, she says, although she points out that it doesn't hurt that Miramax and other entertainment companies are there. She's there because it has a creative environment which presents itself as a home base. The physical setup and flexible layout are excellent for conducting business. Also, she says, there's the ease of transportation and access to good restaurants. She feels like the Tribeca Grill is her commissary and she does a lot of her business there. "The nature of my work is one that is very personal and consultative," she explains. "A lot happens over lunch or at the end of the day." Her avocation is food and wine and she is known to have a special" restaurant radar." Staying in Tribeca gives her greater access to what is new and happening, including on the Lower East Side, where she patronizes many of the eateries in the former pushcart area. A midtown banker or visitor from abroad is likely to be taken to Gigino Trattoria or Gigino at Wagner Park. As a longtime Village resident, her regular business meal haunts also include L'Enfant Terrible on Canal Street, La Metarie on the corner of West Fourth Street and West Tenth and Otto on 5th Avenue and 8th Street. Has her business changed since September 11, 2001? Definitely. "After 9/11 there was a pause in business. You couldn't go downtown and many businesses just changed the way they were working. There were funding cuts and business people were not flying anywhere. So I began to use teleconferencing as a substitute for personal meetings. 9/11 changed the fabric of the area for a while. It's rebuilding now; New Yorkers are resilient, so we've come back with newly generated and robust enthusiasm." Samara watched the airliners crash firsthand. This was her first experience in feeling personally attacked, although previously she had worked in a war zone as a film producer. After the attacks, Samara chose not to apply for assistance but is today part of a Downtown health study. From her perspective, Downtown business just stopped after the attacks. In the years since, her business has been steadily escalating happily and she sees the evidence of rebuilding everywhere. Since the Downtown district is her mojo, she feels inextricably tied to its recovery. She views the Community Block Grants, currently held up in the LMCC, as "terribly important" since they will add to the health of the neighborhoods and provide "an additional draw for people to come there." The stronger the neighborhood is, she says, the stronger she is. There are probably a multitude of professionals like Patrice Samara driving the Downtown economy, but nobody knows how many. She belongs to a not-too-well-understood business community: the Downtown entrepreneurs who are working at the nexus of the creative professions and the corporate community. The self-employed professional class is not surveyed by the Labor Department, so it is practically invisible, as is the "creative class," including artists and artistes-- people who create for a living and are most often self-employed. In the ordinary organization, the strategy is made by the suits and then handed to the creative people for execution. When creative people move up the business ladder, they are even less traceable, since many let go of their professional "trailings"--such things as performing union affiliations, memberships in arts support organizations, or applications for creative project grants. Nevertheless, you can't really know Downtown without knowing these people. They are perhaps the greatest hole in our understanding of the deep structure of New York business. Some professions are fairly interchangeable, with skill sets are shared by a large number of people. Not so these specialists, who fill niche needs in the business structure. Samara recently formed an association as the New York representative of the Washington, DC-based Unison, a design, marketing, and communications firm. With Unison, she is organizing a trade event for the economic representative a major foreign government. Communications have allowed her to expand beyond all borders. This ties her to the "export economy" of New York City, a sector which was significantly investigated in the recent Bureau of Labor Statistics' report, "9/11 and the New York Economy: A borough-by-borough analysis" (June, 2004). (See editor's note below.) The "export" sector refers to that part of New York business which is focused on the national and international economies, and it has taken on new importance in the eyes of City planners since the report came out. However, Samara, like other executives of her type, would never have been counted in that study, since the Bureau does not research private practitioners, even though they are, technically, self-employed "workers." "This shows a big hole in our thinking when it comes to planning the Downtown business district of tomorrow," declared Jonathan Slaff, co-author of DowntownNYC's three surveys on the economic impact of 9/11. "Independent practitioners like Patrice Samara are an economic force Downtown. As a group, they are vital intellectual capital and a unique product of our City. We can't overlook their business needs, and think of only large companies, as we plan Downtown's economic future. This aspect of the 'Export Economy' deserves much more study." SO, YOU'RE PLANNING A CORPORATE ANNIVERSARY? Regardless of the trajectory of the local economy, corporate anniversaries roll along, and so does Samara's business. Known as the Anniversary Queen, she is planning to consult pro bono as a board member with Youth Advocacy Program International, a Washington, DC-based nonprofit, on how they can capitalize on its tenth anniversary for fundraising. For CEOs who are planning a significant anniversary or milestone, she has a six-point strategy for success, but that's a subject for a whole 'nother article. EDITOR'S NOTE ON BUREAU OF LABOR STATISTICS, "9/11 AND THE NEW YORK ECONOMY"
The report was a strong statement on the economic impact of the attacks. Using employment and wage data, the bureau found that the greatest effect of the 9/11 attacks was upon the "export," as opposed to the "local" sectors of the New York economy. Between 2000 and 2002, 82.7 percent of job loss and 111.0 percent of lost wages were associated with the "export" economy, according to the Bureau. The source was the BLS' Quarterly Census of Employment and Wages program.